The AV Bridge MATRIX PRO combines audio and video mixing functionality into a single appliance. 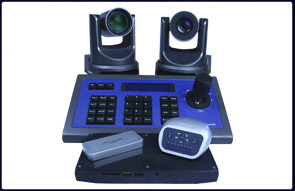 It provides a simple way to add multiple cameras, microphones and other AV devices to a traditional AV room design. It then manages the complex process of mixing, switching and controlling those devices into a single USB stream. 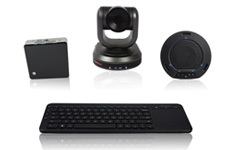 The AV Bridge MATRIX PRO combines the functionality of the AV Bridge encoder with IP and USB 2.0 (UVC & UAC) streaming, a four input seamless HD video presentation switcher, three (3) Quick-Connect™ Interfaces for Vaddio cameras with EZCamera™ Cat-5/5e/6 connectivity, an 8 x 4 crosspoint audio matrix with integrated AEC, four (4) EasyMic™ Ports for Vaddio ceiling or table mics with built-in echo cancellation and a web server for configuration programming, control and remote management. The AV Bridge MATRIX PRO replaces a rack full of gear, and then some. The MATRIX PRO was designed for integrators in order to reduce the complexity of AV system design and implementation, while delivering the features and capabilities most sought after by today’s sophisticated end user. This is for my back up and testing system. All is good. Thanks.